How to Be A Twitter Writer? Wittier and Rather Tighter. Partly because I've been so bad at long-form blogging lately, I'm going to try Twittering for the summer: @chavelaque. And as fascinating as I find my sandwiches, I promise to try to keep my daily-life tweets vs. interesting or amusing thoughts on something like a 1:2 ratio. The last song on the video is the Harry and the Potters anthem "Dumbledore," and what you see in the opening bars is most of the 500 or so people in the room, having spontaneously formed a large circle with arms around each other, equally spontaneously running to the center of the circle and rocking. It set a new standard for epic Potters shows, and I fully support John's closing gauntlet to the Twilighters. -- dragged behind a plane that circled the Cornell stadium. 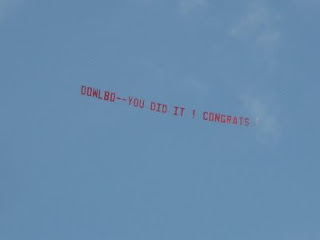 We couldn't find a "Dowlbo" in the list of graduates (though granted, there were 5,000 of them), so we speculated among ourselves who Dowlbo was and why someone might have splurged on him: a message from a relieved wife to a ninth-year graduate student who finally completed his Ph.D.? A love letter from an narcisstic Dowlbo himself? Simply a proud family? That's certainly the most likely option, but also the most boring, when there are so many other interesting narrative possibilities. Any other ideas? We held one of our semiannual battles for the honor of hosting the Frog, which had dwelt for far too long with Hans and Megan in Ithaca. While family friend Josh Shields completed the course first, the game is called Killer Klein Croquet, so we hastily invented the Shields Clause to grant the Frog to the first Klein-family finisher. 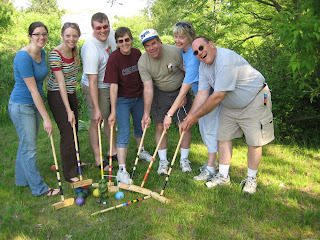 And thus my aunt Carol (brown shirt and glasses in the middle) will take the Frog back to Iowa until we meet again. 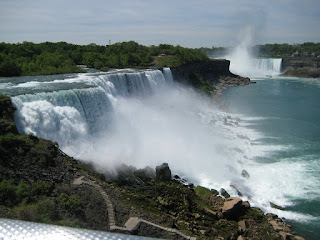 And finally, we saw Niagara Falls. Quite beautiful; quite cold; quite glad I don't have to go over them in a barrel. The entire weekend was thoroughly, thoroughly awesome -- my love and thanks to all involved. I mentioned below that Betsy and I would be hosting a Kidlit Drink Night in conjunction with BEA, and those plans are now in place: Friday, May 29, starting at 8 p.m. at the Houndstooth Pub at 8th Ave. and 37th St. Come one, come all! And a poll: On Friday, a friend and I fell into a conversation about song lyrics. My friend remarked that while she might fall in love with a tune, she never really pays attention to song lyrics. But for me the two are inextricably linked: I hardly ever remember melodies without words; I have to really pay attention to instrumental-only music in order to have some reaction to it; my favorite songs ("They Can't Take That Away from Me," "North Dakota," "I Love Every Little Thing About You," "The Babysitter's Here," "You Must Meet My Wife") all have genius lyrics as well; and I carry a stupid number of words set to music in my head -- especially pop songs of the 1990s, when I still listened to commercial radio regularly. (Also Baptist hymns.) I suspect the difference is that my friend, who is an enthusiastic amateur bassoonist, is much smarter about music than I am, but I don't know for sure. So I'm asking simply: Do you pay attention to/remember/care about lyrics in the music you love, or not? I look forward to seeing the response. #4: Thirteen Reasons Why. A novel about a teenage girl who kills herself and thirteen people who influenced her to do it. #6: If I Stay. A novel about a teenage girl in a coma, making the choice between living and dying. #7: Wintergirls. A novel about a teenage girl whose best friend has died of an eating disorder, pushing herself to that same point. And I thought: What is it with teenage girls and death? Why all these teenage girls at risk, on edge, and no boys? How would these books have been different if they showed the boy version of those stories* -- a boy who killed himself because he was harassed/teased/neglected, a boy in a coma, a boy whose competitive pathology puts him on the brink of collapse? How might the books have been differently received by editors and readers? And what does it say that these stories of girls in extreme situations are so popular now? * I should add that I absolutely don't mean this to criticize any of the authors or editors involved for publishing these books just as they are, as they're all interesting and important books just as they are, and authors have to tell the stories that come to them as they come. I'm just interested in the what-if of switching the genders, and the why of books about this particular gender and death being so popular. I thought all this just sort of as a thought experiment, and then I thought, Well, did I read any books like that when I was a teenage girl? And one title leapt to mind immediately: Love Story. I don't remember how I found that 1970s classic weepie during my freshman year of high school, but I know I adored the weepiness; I saw the movie once but read the book multiple times. I'm not sure that falls under the same rubric as the books above, though, except maybe Twilight. . . . What I loved about it was the romance, and the way the romance was sharpened by death, how much more sweet and sad the story became when Jenny died. (I read a couple of Lurlene McDaniels, too, until I figured out the formula and got bored with them.) But Wintergirls, Thirteen Reasons Why, and If I Stay aren't so much about a romance with a living, breathing boy as they are about a romance with death itself (as I understand them; I haven't read If I Stay), and in Twilight, of course, death and the boy are one and the same. It is my belief that the teenager is a person with three main characteristics. . . . First, teenagers get caught up in their own heads. . . . teenagers think about themselves a lot. They obsess about what they look like, what people think of them, what the point of life is. So number one, too much introspection.
. . . Now, number two, the teenager needs excitement--it's a reaction, I guess, to the realization that life is ordinary. In childhood, it's fresh and exciting, but then you start to see that the grown-up world is boring. So you look for hysteria and drama. You scream at concerts, you shriek when you see each other, you ride on rollercoasters, you get into alcohol and drugs. All year I've been hearing you guys use words like conspiracy, compulsion, pathology -- you get post-traumatic stress from exams; you're always running from the cops. I mean, you guys are just desperate for excitement. You're looking for extremes. You're looking for a climax. Death's finality and hugeness feeds introspection. It is extreme and exciting -- the approach to it, anyway, and the dodging of it, or the struggle or choice to embrace it. And it provides an end, a certainty that has its own comfort (though also terror) in the up and down. But that wouldn't explain why there are so few books about boys and death. So one other theory here (which I'm pretty sure isn't original to me): More than anything else, teenage girls want to be seen. Twilight is a story about how special Bella is, how she is an exception to Edward's rules about humans, how he sees her once and falls helplessly in love with her then. (Love Story = same thing.) Thirteen Reasons Why is about a girl claiming the attention she was denied in life; If I Stay about the people who gather around a girl's bedside, paying attention to her, asking her to stay in life; Wintergirls about a girl who wants to be the skinniest -- to have the least seen of her, actually, and having that be her victory -- until that desire consumes her. Death, in its extremity, promises and focuses attention in just the same way a love story does. And when the two are combined: teenage-girl bliss. One last thing that has nothing to do with death but a lot to do with teenage girls and love: The video for Taylor Swift's "Love Story." I freely confess I'm fascinated by this video, partly because it seems to have been concepted after someone watched "Pride and Prejudice," the What the Hell??? version (but with eighteenth-century dress for the ladies), partly because it (and the song) pushes all my romantic buttons, partly because it pushes all my feminist ones at the exact same time, and then finally because the song is such a well-constructed piece of narrative craft, moving from first glimpse (being seen!) to forbidden love to marriage proposal with Daddy's permission in less than four minutes. As a friend of mine said, "It's total high-school English class crack," and the part of me that is still in Mrs. Markley's Honors English II class third period adores it. Well worth watching, for any of those partial reactions. Another one this month and one in November: On the 28th, I'll be on the bloggers' panel for SLJ's "Day of Dialog 2009" in conjunction with BEA. My brilliant fellow panelists are Liz Burns (A Chair, A Fireplace, and a Tea Cozy), Laura Lutz (Pinot and Prose), and Libba Bray (A Great and Terrible Beauty), all moderated by my friend and yours Betsy Bird; and rumor has it there will be quite the shoe-off (which means I desperately need to go shopping, because, besides the magic shoes, everything I own is as practical and boring as a DVR manual). 9:15 a.m. at the Brooklyn Public Library. Free, and there will be muffins -- can you really ask for anything more? Oh, and Betsy and I will be hosting a special BEA Kidlit Drink Night on Friday night, at a place to be decided . . . um, once I e-mail Betsy back. But it will definitely be Friday, May 29. Leaky readers will already know this, but for others who might be interested, I'm delighted to announce I'll be half of a keynote conversation at the upcoming LeakyCon 2009 near Boston, on Friday, May 21, discussing the writing, editing, pleasures, pains, and nature of YA literature with John Green. Yes, that John Green, the brilliant author of Looking for Alaska, An Abundance of Katherines, and Paper Towns, and the head wrangler of the awesome troupe of Nerdfighters. So assuming I am not utterly silenced by fangirldom, this should be a lot of fun. Tickets are $20 with a LeakyCon registration (I don't think they're available without), and can be purchased at the second link above. * Ten points to the first reader who can guess what other work of children's literature I thought of when I saw this name -- and no, it's not the series published by Scholastic. Coincidence? Or the mark of a French seeker of the Hallows (perhaps even Monsieur Flamel himself)? Who can say?